Lead by celebrity interior designer, Cheryl Eisen, IMG’s “Rise of the Fempire,” installation will honor survivors, women empowerment and prominent advocates for women’s health. Holiday House NYC is an inspiring interior design exhibition featuring the industry’s leading designers and brands. For its 11th anniversary, the highly acclaimed showcase tapped luxury interior design firm, Interior Marketing Group (IMG) to reimagine the home’s grand staircase and property’s six landing areas. Ultimately, Holiday House is a celebration of life, beauty and optimism as an antidote to breast cancer. For each showhouse, designers are given the challenge of creating a space that is inspired by a holiday or day of personal meaning to them. Rather than designing for a traditional holiday, IMG has chosen to celebrate Breast Cancer Awareness Month. IMG is one of 20 talented design firms that will transform each room of the newly-built 32-foot-wide mansion, creating luxuriously appointed spaces and innovative designs. Design chairs for this year’s showhouse include celebrity interior designers Thom Felicia, Carson Kressley, and Vincente Wolf, fitness mogul Tracy Anderson, and Committee Chair Christopher Hyland. Lead by celebrity interior designer, Cheryl Eisen, IMG’s “Rise of the Fempire,” installation will honor survivors, women empowerment and prominent advocates for women’s health. Partners for the project include Arteriors, Bokara Rugs, Chista, Costikyan, GM Star, PB Paints, Phillip Jeffries and STARK Carpet who are pivotal in bringing IMG’s vision to life. Holiday House was founded by 21-year veteran breast cancer survivor, Iris Danker who donates all gala and ticket sales proceeds to The Breast Cancer Research Foundation® (BCRF). 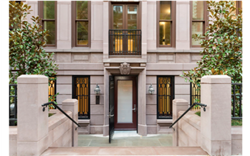 The showhouse will open to the public on October 24 in a luxurious, new eight-bedroom limestone townhouse at 118 East 76th Street on one of New York’s most beautiful blocks. The Opening Night Gala, slated to take place Tuesday, October 23rd, represents the New York interior design world’s unofficial kick off for the holiday season and offers industry insiders a first glimpse at the magnificently re-imagined townhouse. Founded in 2007 by entrepreneur Cheryl Eisen, Interior Marketing Group is the largest full-service interior design and marketing firm in the United States. Combining their unique design aesthetic with a strategic marketing/PR package, the firm goes beyond standard industry offerings to deliver market-defying results. IMG services Miami, New York City, Los Angeles, the Hamptons, and Connecticut. IMG is a woman-owned, women-run organization. Iris Dankner, the founder of Holiday House, is a designer, author, passionate philanthropist and 21-year breast cancer survivor. In 2008 she was inspired to combine her two passions, interior design and fundraising for breast cancer research, to create a high-profile interior design event in New York City to benefit The Breast Cancer Research Foundation® (BCRF). Ms. Dankner currently serves as a member on the board of BCRF and is the recipient of the IFDA Circle of Excellence Award, the Ellen Hermanson Award, the Susan B. Komen® Survivor of the Year Award, and the 2017 City of Hope’s Spirit of Life Award. The Breast Cancer Research Foundation (BCRF) is dedicated to being the end of breast cancer by advancing the world's most promising research. Founded by Evelyn H. Lauder in 1993, BCRF-funded investigators have been deeply involved in every major breakthrough in breast cancer prevention, diagnosis, treatment and survivorship. This year, BCRF will award $59.5 million to support the work of more than 275 scientists at leading medical and academic institutions across 15 countries, making BCRF the largest private funder of breast cancer research worldwide. BCRF is the highest rated breast cancer organization in the U.S.—the only one with an "A+" from CharityWatch and Charity Navigator’s highest rating of four stars. Visit http://www.bcrf.org to learn more.